I neatly packed a wedding gown, full tiered veil, shoes, accessories and floral bouquet all to fit into a small bag like a skilled engineer. I abhor wrinkles and this is my greatest fear above all that could go wrong. And with new TSA restrictions on cosmetics and toiletries, my biggest challenge was attempting to smuggle them onboard. I prayed that the TSA’s wouldn’t do a pat down as I had strategically dispersed them on my body. It went without a hitch as I boarded our 17 hour flight from Washington DC to Johannesburg. When we leveled off, the crew escorted me to the back and instructed me to change into my bridal attire while they did a beverage service. Not an easy feat in an aircraft lavatory. I had to do yoga positions to get into my stockings. Then all activity stopped. The purser announces over the PA for all passengers to remain seated. As I began to walk up the aisle, he read “Since ships sailed the 7 seas, captains have enjoyed the privilege of joining 2 people in matrimony. As world travelers, Terry and Suzy spend half their lives inflight. 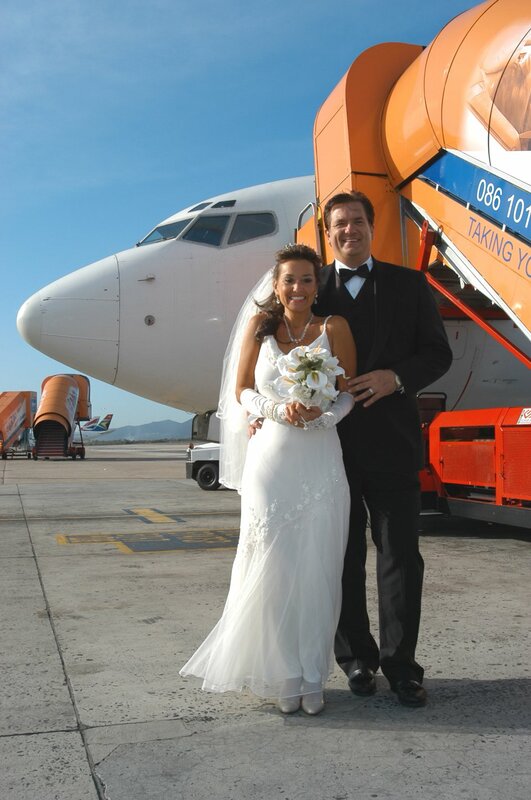 On this day 4 years ago they met on South Africa Airways (SAA) and are honored to be able to share their vows here today.” I joined Terry who was dressed in his tux standing next to SAA Captain Richard Holdengarde who did our nuptials. I believe he was as nervous as me while he read our vows. It was beautiful and I shed some tears of joy. Terry and I then walked down the aisle as all applauded. The media was onboard, for this was a first in aviation history and not an easy feat to arrange. We were moved up to first class for interviews and photos while the meals were served. We were presented with some lovely South African gifts from SAA. The crew distributed our wedding favors for all. On deplaning, we were met by the airline management and did some photos outside the aircraft. Entering baggage claim, people stared at us in wonderment. The event was enjoyed by all passenger and certainly a dream come true for us. I collected my group, loaded the coach and checked them into the beautiful Cape Sun Hotel. The manager assigned Terry and I the penthouse suite on the 32nd floor with spectacular views of Table Mountain with 5 rooms, jacuzzi, roses, chocolates, champagne and local wines which we gave to our group. Exhausted by then all we could do was to conk out into our king size bed for a blissful sleep. We later learned from locals enroute that our little wedding in the air was broadcast on the news and announced nationally in all the country’s newspapers. Imagine that, we became famous for a moment in the land of the Zulu. My company, Adventures For Singles Inc., has given South African Airways a lot of group business throughout the years and they provided us this opportunity more as a favor than for publicity. It was a once in a lifetime experience and we remain forever grateful and loyal to them.